In chronological order it is the most recent crag. 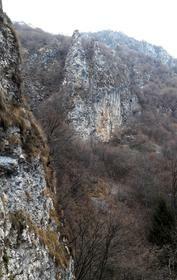 The cliff is located on the right of the valley, being the only one with such characteristic it offers an optimal exposure especially in the winter period. The structure is divided into two sectors, a tower with vertical plate movement routes with medium difficulty levels, the other overhanging with continuity and sustained difficulty. Access: From the ValSeriana state road, follow for Clusone and then Castione della Presolana; from the center of Castione, take the road to Rusio on the left and park just before the village on the right (opposite a carpenter's shop). Continue walking on the road and shortly after about 100 meters take the dirt trail on the left (indication Rino Olmo), first uphill, then flat up to a fork. From here take a bridge on the right that leads to the stream where there is the real mouth of the valley. After a few meters you reach a Roman bridge, continuing along the wide path you cross the river again and along the path that runs through the valley you reach, after three hundred meters, a concrete bridge. Always from the bridge taking the path on the right you can easily reach the Falesia Chìgnol. A total of 25 minutes' walk from the car. Rock: Very compact gray limestone with holes and notches. alcare gray in holes and clocks for the tower of the Maya and the Parentino.